That’s it. 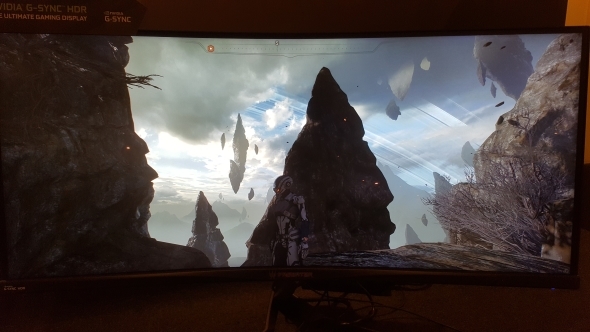 I’m definitely not playing Mass Effect: Andromeda again, at least not until I get my hands on a G-Sync HDR monitor anyways. I didn’t think it was possible for anyone to ruin the game for me more than the writers had already, but with Nvidia showing the SDR and HDR versions cheek-by-jowl, I’m done. They’re still not quite here, so here’s our pick of the best gaming monitors you can buy today. At Computex this week, Nvidia were once more showing off the same Acer and Asus G-Sync HDR monitors we saw at CES at the start of this year. 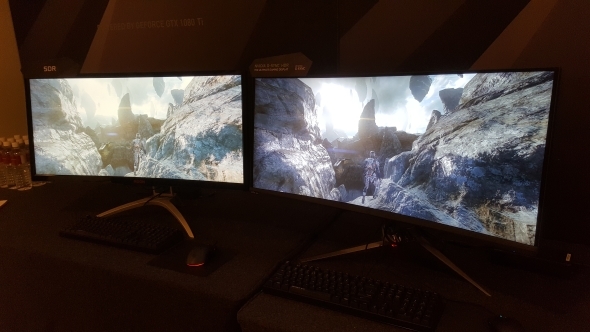 The big change, though, is that the two new 4K 144Hz beauties are actually coming out this summer. But Nvidia have now ruined those for me too. In a little demo-room away from the show floor Nvidia’s Vijay Sharma took me through a pair of new screens set to arrive at the end of the year, delaying my search for the perfect gaming monitor even further. The Asus ROG Swift PG35VQ and the Acer Predator X35 are two stunning 35-inch ultrawide G-Sync HDR displays, both with the same Quantum Dot panel and each capable of running at 200Hz out of the box. 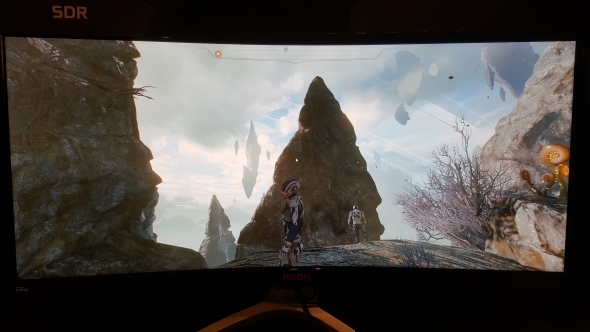 Both were set up next to one of AOC’s AGON AG352UCG, itself a very capable ultrawide G-Sync gaming monitor with a 100Hz AU Optronics VA panel inside it, and all of them were showing either still images of, or actually running, Mass Effect: Andromeda. And it looks fine on the AOC screen… until they turned on the G-Sync HDR displays next to it. The pictures below can’t do it justice, but instantly the AOC version looks flat and washed out. Suddenly it looks like an old TN panel by comparison. As is the way with HDR, there is far greater detail in both the very brightest parts of a scene and the very darkest. It’s possibly ever so slightly over-done with ME:A, but that is always the way of things with a new visual technology – remember the first generation of ‘HDR’ in games and just how blown out every game suddenly tried to be? Yeah, that. Both the Acer and Asus monitors are using the same AU Optronics 35-inch, curved VA panel and have been working with Nvidia to get them up to G-Sync HDR spec. They’re able to hit 1,000 nits of peak luminance and use the Quantum Dot nano-filter over the panel to boost the colour gamut. “You can show colours at a much higher brightness without losing saturation with Quantum Dots,” explained Sharma. The other big news for these panels, and one of the reasons they’re so damn chunky behind the curved display, is they’re rocking 512 zones of individual backlighting across the monitor. The AOC, on the other hand, has one. That means in parts of the scene which are physically close together it’s possible to have very dark and very bright sections in much tighter proximity than would otherwise be possible. The 16:9 G-Sync HDR screens coming this summer have 384 individual backlighting zones. It’s this highly controllable backlighting which allows the displays to have such impressive levels of contrast. But the panel is only one part of the picture. As a G-Sync HDR display it needs Nvidia’s new, updated electronic inside the monitor itself. And that new G-Sync HDR module has to do a lot more work now too. And that means these new displays aren’t going to come cheap when they do arrive later this year. At the moment, you’re looking at $1,000 – $1,200 for the best ultrawide gaming monitors and the G-Sync HDR screens are going to be much more than that… at least to begin with anyway. But again the hardware itself is one half of the HDR puzzle. Content is arguably even more important than the displays. You can have the greatest HDR monitors in the world, but if the HDR games made for them look rubbish, who’s going to spend the enormous amount of cash needed to get it back home? So where’s the content? Mass Effect: Andromeda is here, Hitman has been retro-fitted with HDR, but what else?